Over a year has passed now since MCAR learned through anonymous tips that a large number of animals were being hoarded and held in horrific conditions by an elderly couple in Mitchell County. This led to a large-scale rescue involving multiple organizations across the state. Fifty-nine dogs, puppies, cats, kittens, and chickens were rescued. Every one of those animals has a story to tell. This is Gabe’s story. August 19, 2015, the day of his rescue, is the day I celebrate his birthday, the day he was truly given his life. As I write, he’s lying a few feet from me with a jellybean wrapper between his paws and a scrap of leather that’s become his favorite toy. I can reach out to pet him. If this sounds unremarkable, it is anything but. Only a few months ago, he would not sit this close to me, much less in the same room. He didn’t know about toys, was never relaxed, and wouldn’t let me touch him. Fortunately, Gabe does not dwell on the past. If he did, he would remember living alone in an outdoor cage open to the sky, a blue plastic barrel in the dirt for shelter, green stagnant water to drink, a gate that could not be opened due to mud washout over the years, scraps of food thrown over the fence. He would not remember affection or haircuts or companionship or comfort for his fears because those things didn’t happen. He’s come a long way in a year. Once he arrived at the shelter that August day, he was not docile or feeling grateful. 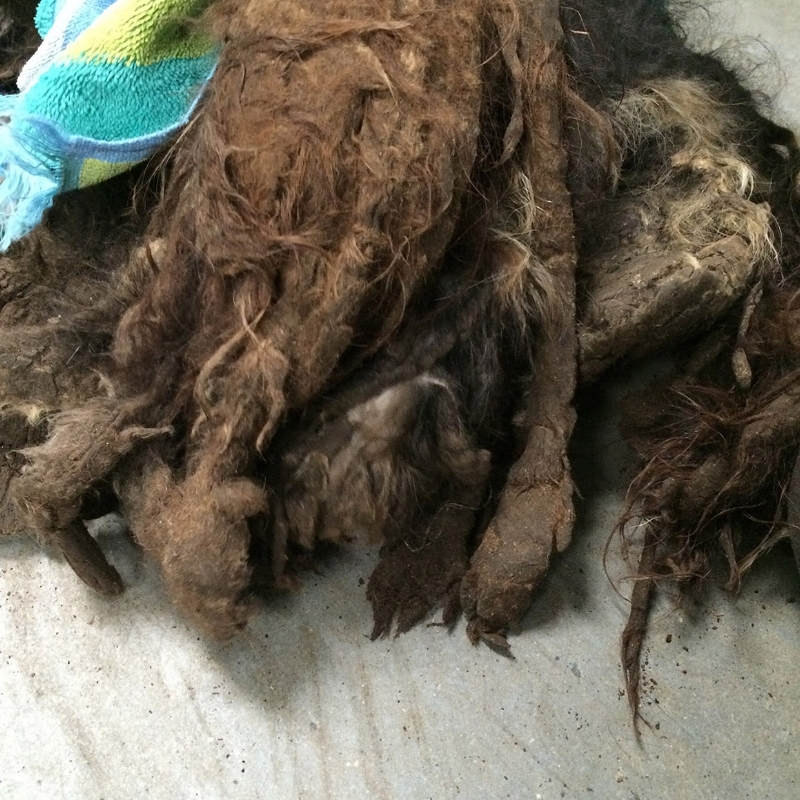 Taking him out of the carrier, staff was met with a misshapen mass of hair, dreadlocks caked with feces, mud, and sticks that dragged the ground. If you counted the appendages, there were far more than a dog should have. His head was nearly indistinguishable from the tail, and it wasn’t clear what was a tail and what was a leg. The staff’s best guess was that he was a female Shih Tzu. He had to be sedated so that Amber and Karen could shave the hair away to see what was left. They carefully cut off the masses with scissors and clippers, barely able to separate his skin from the hair so tightly knotted that it held his neck down at an odd angle, completely covered one eye, and made it impossible for him to lift his legs. Those mats of hair held his entire history. Two hours later, he was released three pounds lighter. Left was a very thin, twelve pound, adult, male Mini-Schnauzer, unfixed, splayed toes, swayback, blind in one eye, and the luckiest dog on earth. As he lay, still sedated, in Amber’s arms, we thought he looked like an angel. Amber named him Gabriel, after the angel. Over the next month the shelter staff brought him back to health, building strength and confidence, and helping him get used to human touch. He was neutered, was treated repeatedly for worms, and had seven teeth pulled. MCAR was very grateful to receive an emergency relief grant from PetSmart Charities for $14,500 that helped defray the expense of the animals' care. He came to live with me in late September. My dogs and I were to be his foster home until he was adoptable. I knew right away he had found his home. The first afternoon with him was rough. It took three hours before I could get close enough to remove his leash. He was panic-stricken and really smart. If cornered, he had the urge to bite. He had never worn a collar or walked on a leash and clearly did not trust me at all. He only began to calm down when I stopped looking at him or paying him any attention. I learned to move around the house in slow motion. An unexpected move would terrify him and send him panicked, slamming into walls and furniture, a situation made even worse by his blind eye. If he was comfortable in a particular spot when a noise scared him, he would not return to that spot. Ever. He wouldn’t step into smaller rooms and always scoped out his exit routes. He would eat only when his bowl was next to the back door. Any change in a room, such as a book on the floor, made him wary. A knitting needle falling to the floor or a sneeze would send him flying out the door. And he can make himself very small, the way he hangs back, inconspicuous. That first night he settled easily onto his new dog bed until I came close. Wondering if he could get comfortable with me nearby, I lay on the floor with my head on the dog bed. Lying there completely still, eyes closed, he eventually stopped his low growl and came closer to sniff around, finally climbing onto the bed to lie down. What happened next will sound unreal. I thought he was pushing his towel around to make himself a comfortable nest as he nudged it towards me. When he seemed satisfied, the towel was pushed up against my face. But he wasn’t done. He lifted the towel in his mouth and put it over my head, nosing it into place around my entire head and neck. He deliberately covered me up! Surely this was a message. I hoped my four dogs would give Gabe tips about being a dog. Of course the lessons they had in mind were not necessarily the things on my list. Lesson #1: Never Step Outside on a Rainy Day. He learned that one surprisingly fast for a dog who had spent his life outdoors. They’ve taught him how to play with toys, lift his leg, and wrestle. And he watches them for cues that I can be trusted. If they play with me, so will he. Gabe watched Ollie chew on a plastic chew bone he dug out of the toy box. From bed that night, I heard noise in the living room about 1:30 AM. Gabe was chewing on that bone. By the end of the first week, he let me rest my hand on his back. Not long after that he would come almost close enough to pet IF I was sitting, IF I would reach just beyond comfort to touch him, and IF there was nothing in my other hand. I had to learn the rules. It was another three months before I could touch his head and eleven months before I could pet him with both hands. Last December, thanks to a grant from Pedigree, Adinna from Blue Ridge Dog Trainers began working with us. Dog training, I learned, is really as much human training. My first lesson was to put a leash on Gabe and keep him at my side as much as possible over the next month. Adinna had me get a padded wire dog crate so Gabe had a place to call his own where he always knew he was safe. We practiced taking the leash on and off. Over the next few months, he learned to sit (more or less), go to his safe place if he was afraid, to relieve himself in one spot in the yard regardless of weather, how to jump into the car. We made trips to the park to walk on the leash and see new sights. He was afraid of everything at first—kids, bright colors, camo jackets, skateboards, grass, ducks. At first, he plodded along with his tail and head down like on a death march, never stopping to sniff or lift a leg. But recently in the park, I heard a young girl comment that Gabe prances. Made me proud. For our third training session, we met at PetSmart for some socialization. He was clearly in a foreign land, leaping to hide in a bin of toys when the announcements scared him. We saw the sights for 20 minutes, which was the amount of time Adinna thought he could handle before the novelty started stressing him. From Adinna, I learned to let Gabe adapt at his own pace, not to push him to do things that scare him. If I try to force something on him, even something he enjoys, he’ll avoid me for days. I learned to expose him to new things for only a short time so they aren’t punishing, and how important it is to have a safe place where he knows he will be left alone with no expectations to meet. In this last year, he’s had a lot of firsts: he’s worn his first collar, had his first haircut and bath, been brushed, walked on a leash, gone for a ride, walked in the park, put his feet in the river, had treats, a ball, stuffed animals, gotten Christmas presents, eaten turkey at Thanksgiving, and been best friend to an orphaned kitten. Has a bed of his own in a warm house. He’s gotten the courage to jump up and sleep on the couch. (That took nine months.) Last week, he started sitting by his food bowl every evening at 5 PM. Still, he doesn’t want to be too close, but also doesn’t want to be too far away. He loves watching other dogs play. He seems torn between acting on experience and his hope for good things. I still look forward to the day he wants to sit in my lap. I don’t know if Gabe will ever fully recover. I do know no one will ever yell at him or hit him or ignore him. He’ll never live outside or be tied to anything. He’ll never be cold or hungry or be alone in the thunderstorms that scare him. And I know he’s not done healing, but each day that passes takes him farther from his unimaginable past. It takes a really long time to ease the damage done. But he has a place and purpose, a family. He knows he’s loved and needed. Gabe is my hero. I’ll never understand what kept him going. He is still suspicious of all the things he should be suspicious of, and I understand and sort of admire that. It’s a skill that has helped him. I could talk about how lucky he is but that kind of luck only comes after unspeakable bad luck. So instead I’ll tell you how grateful I am to learn from his resilience and benefit from his capacity to love and to trust. Today, after fourteen months together, I can tell he wants to lick my face. When he wants something, he can make it happen.